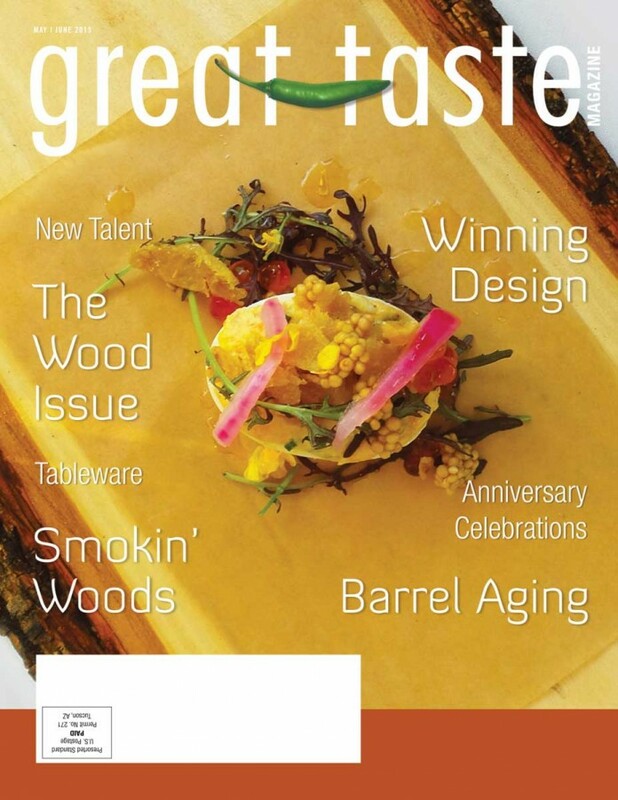 Great Taste Magazine 2015 May June issue will cover all things great about wood in restaurants design as well as adding flavor to food and drinks. Our issue will cover all things great about wood in restaurants design as well as adding flavor to food and drinks. The issue will show you how the beauty of the wood pattern, color and texture adds to the dining experience. We have also gathered wood ideas that other restaurants have used for you to get inspired from; serving platters, smokin’ woods, and architectural details and the various types of woods and finishing. Some of our contributing writers, James Wood and Sonya Kelsen, go over how specific woods are used for adding flavor to wine and spirits. We invite you to celebrate with us on the anniversary of Schooner or Later, Bosscat Kitchen & Libations, IL Barone Pizza E Pasta, and Park Ave. Find out the cheese and produce of the month as well as how to properly take care of your wooden cutting boards. In the issue we go over barrel aging and how this trend has moved from wines and spirits to cocktails, beers, and cigars. We have also included a recipe so that you can do your own barrel aging. As we head into summer discover why a Saison is the best beer to cool off with and how a tulip glass can make the experience ever better. We go in to the architecture of restaurants and how wood has been artistically incorporated in to their structures. There is also a list of woods that are used to smokn’, find out what flavors they will add to your dishes and what foods are best paired with that specific type of wood. Wood is a beautiful and natural material that has served many purposes. From this issue we hope that we have sparked inspiration and appreciation for wood. Great Taste Magazine 2015 May June Issue covers the restaurants and the professionals with resources, recipes, beautiful photos and many tasty tidbits. Great Taste Magazine, the premiere connection to all the key decision makers in our local Southern California restaurant industry. Each month our 15 year-old full-color trade publication reaches thousands of the area’s top restaurant owners, general managers, executive chefs and buyers. Take a tour through the magazine. Each issue features a restaurant and local chef, and is packed with the timeliest information, critical operational tips and other industry news important to our readers. Hot Off the Press May/June 2015!